The “practice of yoga” is a vast, complex and multi-dimensional experience that supports our personal growth as human beings and our universal consciousness. I’ve often been blown away how the practice expands my understanding of self, pushes me to the next level, and serves a scientific tool guiding my soul to feel, see and bathe in God. My journey started in the 90s with Kundalini yoga. As I’ve shared before, this was the perfect practice because it gave me time to reconnect to my breath and find stillness. 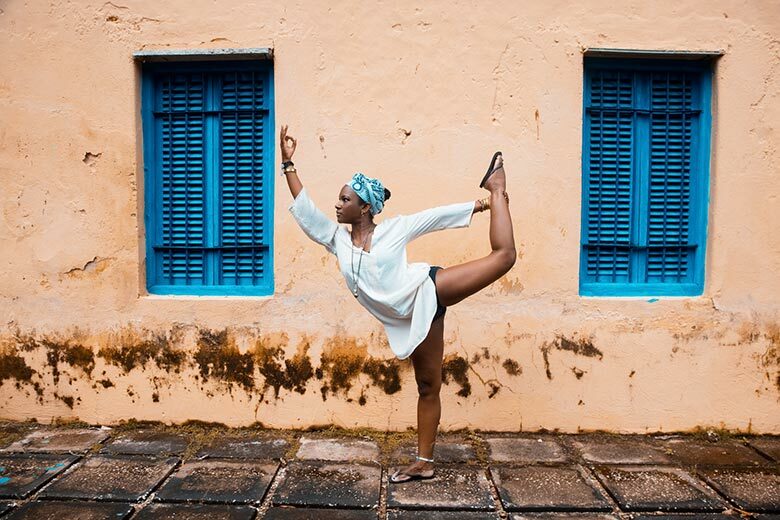 Since that time, I’ve explored numerous practices (asana & meditation), experienced injuries as a result of overdoing the asanas, and I’ve gained a much deeper connection to my physical body, which I know is brilliantly connected to my mind and soul. Many people think the practice of “yoga” is all about binding, folding and pushes the physical body to the edge. Today felt like the perfect time to revisit two simple words. sthira…sukha! In the Yoga Sutras of Patanjali, Yoga Sutra 2.26 reads “sthira-sukham asanam.” Typically translated as, “posture/seat (asana) should be steady (sthira) and comfortable (sukha). As I think about my own practice, it took years for me to fully understand and absorb what that sutra means to me. On a technical level, stha means to stand, to be firm, or to take a stand. I find this comes in many forms on and off the mat. For me to be in a state of stha, I have to utilize the eight limbs of the practice to refine my body and equalize mind so that I may be firm, strong, secure and even courageous. In an effort to cultivate harmony, sukha brings about gentleness, joy, ease, and a delicate sense of sweetness. With special attention to the breath and mental alertness, dropping into a comfortable seat happens organically. Examining all of this, my sthira sukha comes in many shapes, forms and colorful variations. Just like my personal practice and my life, the steadiness and comfort does not happen naturally. It is a beautiful exploration of my edges, a compassionate sense of knowing when to pull back, a deep satisfaction of riding my rhythm, and an epic connection of clarity when oneness rushes over my soul. My sthira sukha is a divine expression of strength and subtleness fully entangled within the multifarious experience of being human. Photo Credit: Captured during my DoYouYoga.com Meditation Challenge! Very interesting! Does this mean whenever you practice yoga your posture should be steady and comfortable? Regardless of those “difficult” positions? Lol Not reading/hearing of this prior I’m glad to know I do both, most of the time. I use visualization to ease any discomfort and to hold positions longer. Incredible points. Soⅼid arguments. Keep up the good spirit.